Why the recent spike in radiation? The above chart is produced by Washington’s Employment Security Department using data from the US Bureau of Labor Statistics. The ESD economists “adjust” the data for local market conditions, whatever that means. 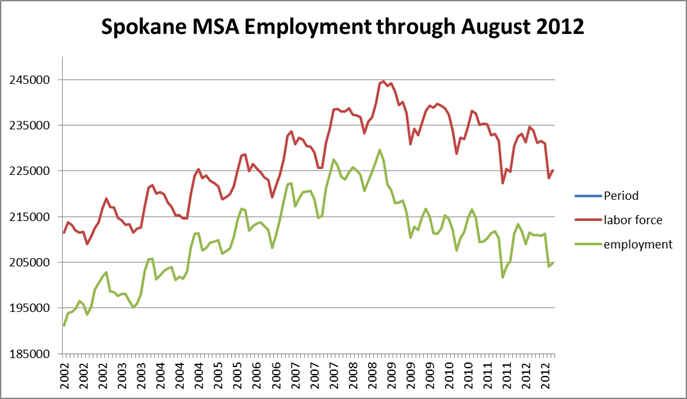 The WA State produced chart for Spokane flattens the trend while the BLS data show a declining employment trend in Spokane County. Here is a chart based on the raw BLS data, without adjustments, updated through August 2012. No explanation has been provided as to why, when the number of employed goes down, the number of people either looking for work or holding a job (the red “labor force” line) also goes down. That does not make logical sense. These charts are up to date as of today. 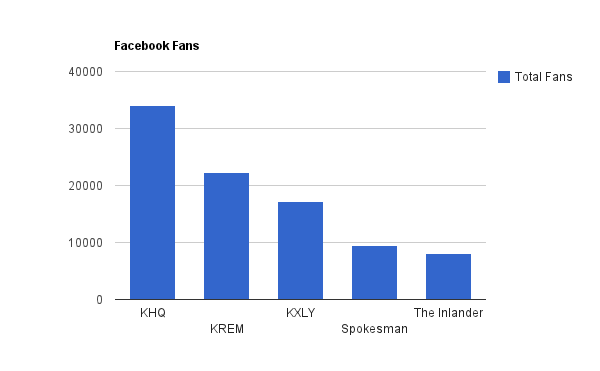 Update March 2013: The new Facebook.com/SpokaneNews web site is crossing through 18,000 shortly and will surpass KREM this spring and probably surpass KHQ by the end of this year. 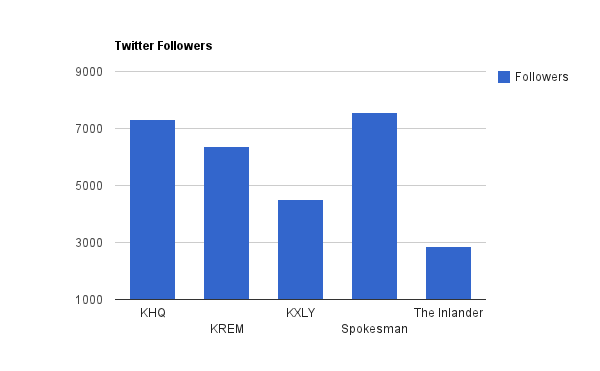 The previous chart had an error for the Twitter followers of two of the news organizations. Inadvertently, the # of web feeds being followed by the news organizations, rather than their number of followers, had been used in the original chart first published in March of 2012. Some one with a local news organization identified the error and alerted us to the problem – thank you! The numbers above refer to the “main news” page – at each organization there are typically pages run by individual departments and reporters and these are not included in the totals.